The Gate Pub is a traditional village/town pub located on the Herts/Essex borders, in the village of Sawbridgeworth. We, the Barnett family (Tom, Jean, Gary and Tracy), have run The Gate since 1988 and have built a reputation for beingamongst the best, if not the best, real ale pub in Hertfordshire. 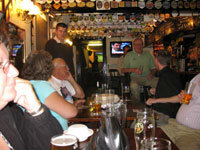 You will be sure of a warm welcome when you walk through the door, with the pub frequented by both young and old alike. We have 6 hand pumps and 2 beers on gravity, with our beers constantly changing. Since 1990 we have served over 7,000 different beers. The walls are laid out with the pump clips - over 6,400 have been collected in total - and is believed to be one of the largest collections of pump clips in the world. We also have a selection of ciders, including our own Gate Ruby Cider. We serve food at lunch times and early evening at very reasonable prices, with Sunday Lunch in particular being very popular. 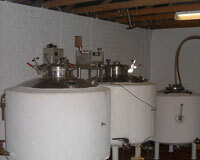 The Gate is also the home of the Sawbridgeworth Micro-Brewery. The beers are only available at The Gate or at selected beer festivals. You can also take our beers home with you. We now offer our beers in 5, 9, and 18 pint polypins. Click Here for beers and prices. We run regular beer festivals with the largest being held in a marquee erected in the car park over August Bank holiday weekend. Tom is a former professional footballer, and as you would therefore expect sport is an important part of the pub, with six darts teams, two football teams, cricket, pool, crib and dominoes teams.